We have a new member of the family. We’re going to go pick her up next week. And drive her back to Baltimore. We’ll be driving through 13 states, an estimated 71 hours of driving time, and 4200 miles. Now, I’m not sure we can win when we start with just 13 days left in the year long challenge, but we’re going to try. You can check out the list of the places where we need to take a picture of the car here: Moss Challenge List. 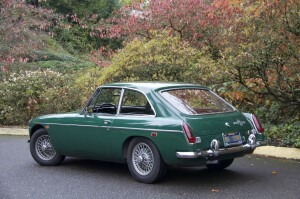 We (my husband and I) have just bought our car — a 1969 MGB GT. We’re going to pick it up on Thursday, December 18. It’s in Portland, Oregon. We’re in Baltimore, Maryland. Then we’re going to drive it home. Portland to San Francisco to Bakersfield to Phoenix to El Paso to San Antonio to New Orleans to Jacksonville to Baltimore. With a few detours and extra time in San Francisco, New Orleans, Jacksonville, all the necessary places. Total: 4200 miles, give or take. The car is being prepared for our trip by Chad Cansler of British Motor Care in Portland and he seems to buy his parts exclusively from Moss Motors, so we’re bona fide Moss customers for this car already. We’ll be back in Baltimore on January 3 (which is a Saturday). I can FedEx our entry form and thumb drive with photos on Monday, January 5 and you’ll have them on Wednesday, January 7. So, what do you think? Can we have a little extra time to play? If you’re wondering why we’re doing this . . . then the posts on this blog for the next few weeks will only confound you more. UPDATE 12/11/14: Moss Motors has graciously extended the time to submit our photos for the Challenge. Yay! If you have any ideas about where we can find the required destinations for a photo with the car, leave the details in a comment. Our route is basically I-5 south from Portland to San Francisco. Down the coast south of SF, then over to Bakersfield to touch a wheel onto Route 66. Drop down to Phoenix, then I-10 straight across the country to Jacksonville. Drive safely and see you soon!! Looking forward to seeing you, as well. And getting a picture of the BGT with a Golden Gate backdrop! Yes, a picture from Conzelman Rd. a must! Give us a hint. Where’s Conzelman Road? It’s directly across the GG Bridge – various points along the road look back thru the bridge toward SF. An iconic spot – similar to Fort Point, underneath the bridge on the SF side – where Kim Novak jumps into the Bay in Hitchcock’s Vertigo. Perfect. That’s exactly the shot I’m looking for. Thanks, David. Good Going. Keep the wind behind you and have a great cross country ride. Can’t wait to go for a ride in your new wheels. The MGB looks great in the photo. The car has exceeded our expectations. Ooooh, I hope you didn’t bypass the entire PCH with its twisty windy coastline views! You need to check out day three (with video). I bet that was the Road we were on coming into SF after an all day and night drive from Seattle. The date was a week after Labor Day in 1962. We were married, and students at the U of I in Urbana. Ages 22 and 21. Perhaps the Interstate did not exist above SF, because we were in a Redwood forest all the way down in the Dark Night. We stopped and could hear the surf but could not see it. I began to hallucinate so we stopped to sleep in the car. When we woke, it was light, we looked around. Next to us was wall to wall commuter traffic, and just over there in the mist was the BIG GG Bridge! We did 7,000 miles in three weeks and saw every National Park and Disneyland, too.